Even during one of the greatest track and field meets in high school history, Mt. Pleasant's Vashti Thomas was a headliner. The state championship meet was regarded as one of the greatest in its 89-year history, with three national, four state, and six meet records broken on Sacramento's Hughes Stadium track. Thomas, a junior, smashed the national federation record in the 100-meter hurdles, clocking 13.03 seconds in what proved to be the fastest high school race of all time from top to bottom. Never before had six girls in the same race broken 14 seconds. Besides Thomas, two other Central Coast Section athletes earned prominent victories at the meet. Castilleja senior pole vaulter Tori Anthony set a girls national outdoor record of 14 feet, 0 3/4 inches. And Mt.Pleasant senior Jeneba Tarmoh became the first girl to sweep the 100 and 200 meters in back-to-back years since Allyson Felix of Los Angeles Baptist in 2002-03. 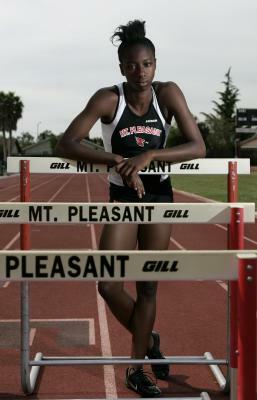 But it was Thomas who was selected as the Mercury News girls track and field athlete of the year. It wasn't just for her record - improving on the 13.20 run in 2000 by Nichole Denby of Riverside's J.W. North - but for her 24 points that paced the Cardinals to their first state title. Thomas was second in the triple jump and third in the long jump. "Wow," Mt. Pleasant hurdles coach Angela Hill said. "What are we going to do next year?" Even after Thomas broke the section record with a 13.46 at the Stanford Invitational in March, Coach Steve Nelson figured she still hadn't tapped her potential. "Our attention was concentrated on getting her to another level," Nelson said. Midway through the state final, Thomas blew past defending state champ Julian Purvis of St.Elizabeth-Oakland and Ke'Nyia Richardson of Holy Names-Oakland to win going away. "I knew she had a 13.03 in her," Hill said. "I just didn't know she was going to get it now." She still has plenty to shoot for - the all-time high school record of 12.95 set in 1979 by Pennsylvania's Candy Young for one. Young's time doesn't count as a national federation record because it wasn't in a high school meet. "Now, she has a name for herself," Nelson said. "And everybody will be gunning for her." There could have been resentment - a foreign student arriving to whip the tails of the natives. 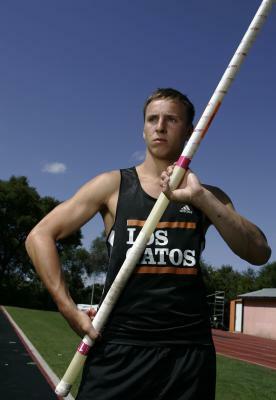 But for Los Gatos High pole vaulter Nico Weiler, there was none. It may have due to multi-cultural Santa Clara Valley, or to his outgoing nature. But Weiler considers a different reason: the fraternity of the event. "The pole vault is not like any other sport," Weiler said. "They are happy for each other, happy for everyone. It's like that all over the world." That is fortunate because Weiler indeed kicked some tail. Weiler, a junior foreign exchange student from southwest Germany, was taught the event by his father, Roland. Dad was a promising young vaulter himself until he injured his back while weightlifting. With a best of 16 feet, 5 inches, and an appearance with the German under-18 national team, word spread of the new German kid who might test St.Francis standout Casey Roche, the Central Coast Section record-holder with a best of 17-5. But Roche no-heighted at his league finals and was eliminated from postseason competition. Meanwhile, Weiler got better and better, breaking Roche's record with a 17-6 1/4 jump at the CCS finals. He followed with a state-meet record 17-2. The question now is whether Weiler will be allowed to defend his state crown. A CIF rule prevents exchange students from having a second year of eligibility. But Weiler can circumvent the rule by obtaining a student visa and becoming a U.S. resident. Weiler said he wants to stay. "It depends on the visa," Weiler said. "Some visas for exchange students include a clause that you have to go home for two years. If mine does not include that, I will be back."